Practice Area: The practice facility at Edgewater has 40 tee stations available and 6 target greens to take dead aim at. In addition to working on your full swing you can master your short game at the pitching and chipping area. The short game area has two bunkers, pitching tee, and target green. Description: This new course just opened in September 2008. 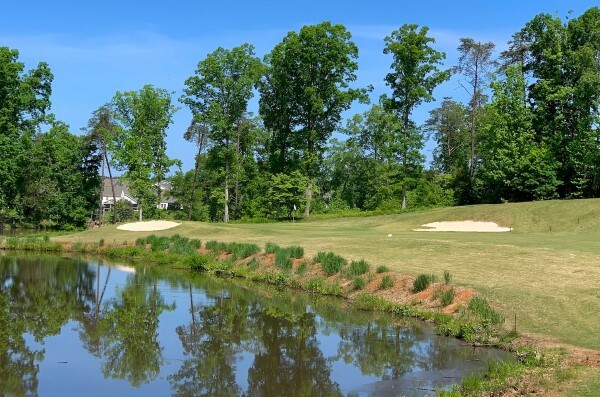 Edgewater Golf Club is an 18-hole championship golf course carved out of the rolling terrain and majestic pines of the Carolina country. It features A1/A4 Bent grass greens (similar to Augusta National's purely A1 Bent grass greens) and Bermuda fairways, rough, and tees. Notes: Sign up for their weekly newsletter to get emails about specials and tournament events such as the ESPN Challenge Qualifying Tournaments they host. B-Man's Take: Played this for the first time in July '09 and was very impressed. All 18 greens were immaculate. They are some of the best bentgrass greens I've played around Charlotte. My favorite hole is the short 429yd par 5 #17 -- my first two rounds I shot eagle-birdie on this hole! My hell hole was the seemingly benign 386-yd par 4 3rd hole. This dogleg right has a tall tree guarding the turn and then a lake that curls around the green -- it bit me twice my first 2 rounds. The staff here is great and you can get the low twilight rate ($30) after 2pm on any day. There are also coolers about every 3 or 4 holes on the course with free water bottles. The course is a bit of a haul from Charlotte, but fairly easy to get to if you come down Hwy 521 to Hwy 9. Golfholes.com - Offers 18-hole photo tour and discount coupons for this course.